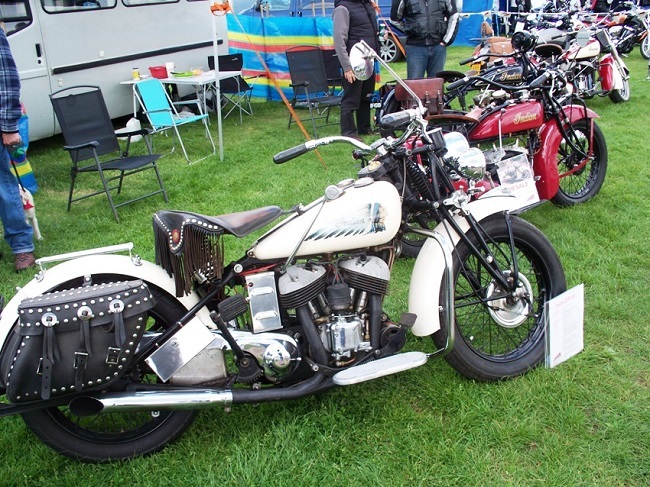 This show was held on the Peterborough Showground on the weekend of the 14th / 15th May. This was the second show here arranged by MCN. It promised to be a good show and it lived up to expectations. 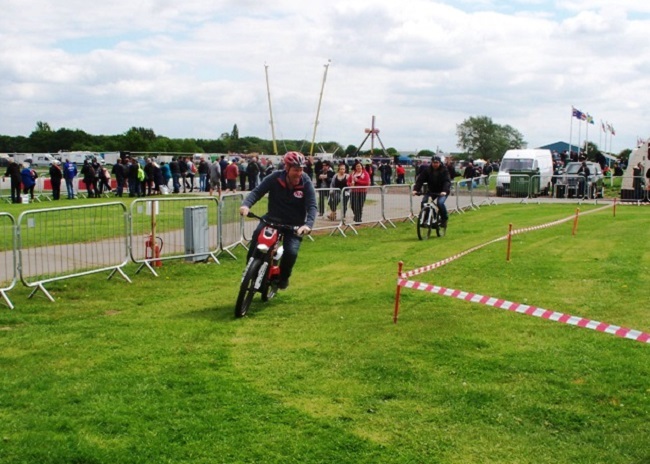 There was lots to do, including test rides on the latest bikes from most of the major manufacturers, and Steve Colley, well known for his stunt trials riding, gave several displays over the weekend. The Wall of Death was busy as well. 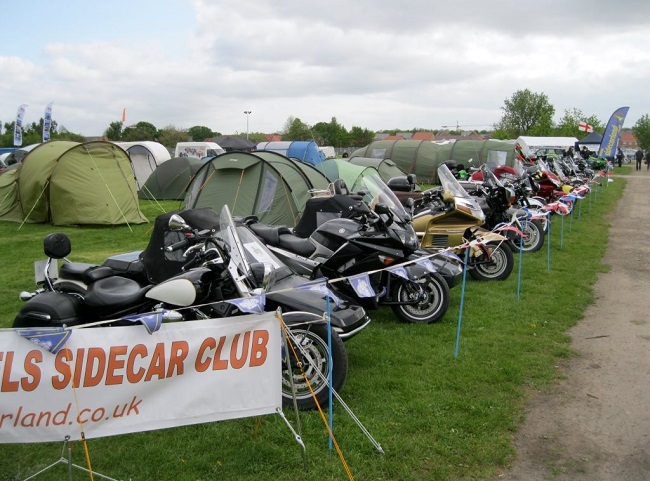 We were lucky in that we had a contact at MCN – a chap called Dan Sagar, whose official title is “Club Zone Organiser”. 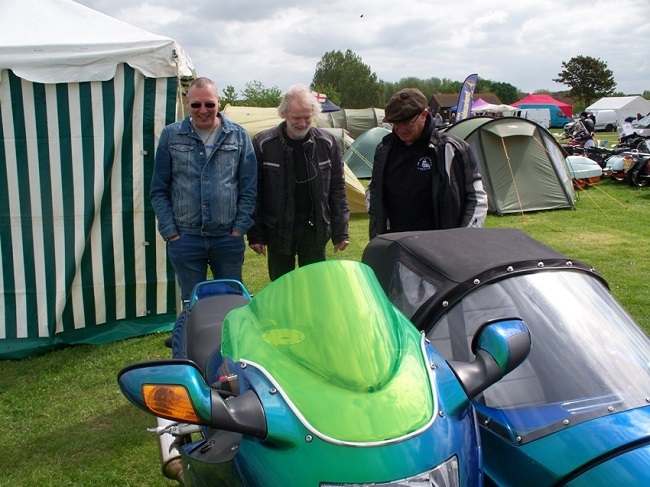 He had been very helpful in the organisation of the plot for our sidecar display; lots of e-mails had been sent and we were eventually allocated four adjoining plots (for the Fed and Tri-Anglia Wheels), as Dan said that this would become “Sidecar Island”. Between the two organisations we put up a terrific display of outfits when over 20 turned up. When parked up these covered three perimeter sides of the plot. There was lots of interest from visitors to the show, and the Fed signed up a new member. 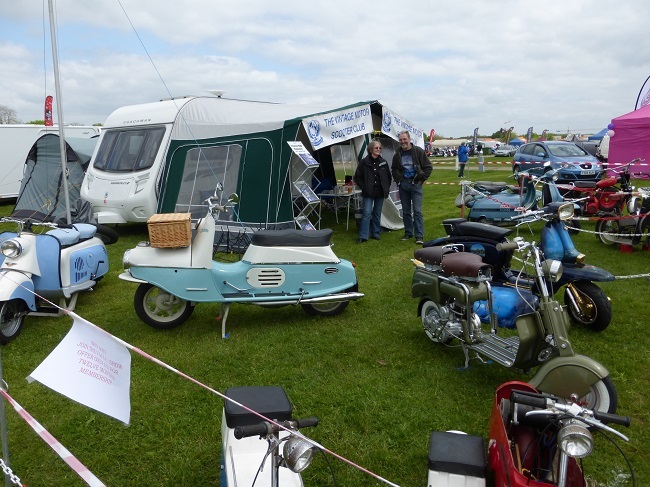 Martyn also told me that the Tri-Anglia Wheels stand had a lot of interest as well. I feel that a few more outfits could be on the road because of the display at the show. I could not get to the show until Saturday morning; luckily Martyn was able to pick up all the entrance passes at the gate when he arrived on Friday. 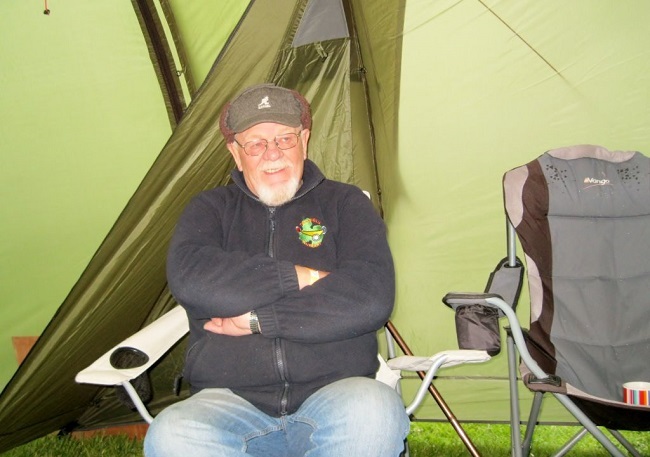 Chris and I were up at 5.00 am on Saturday morning and I arrived at the showground just before 7.00 am. There was not much of a queue at that time so I was soon on to the site. I managed to find our stand; normally I bumble around looking for it, listening out for a shout from Lesley telling me that I have arrived; however I made it all on my own this time! The Fed had its stand at one end of the plot and Tri-Anglia Wheels’ stand was towards the other end. This was good because it meant that questions from the public could be answered along the whole length of the plot. 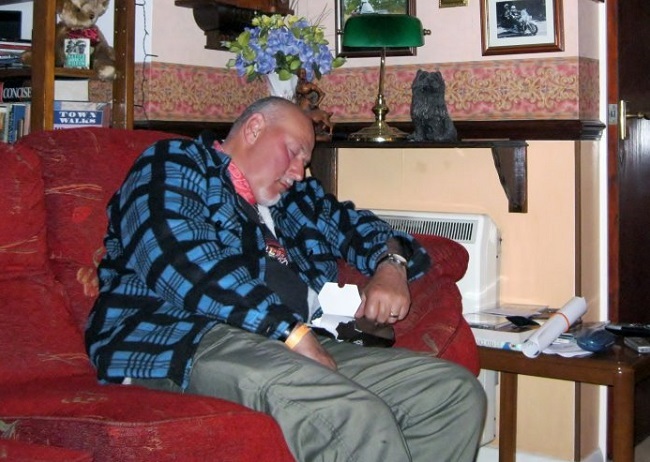 I soon had a cup of coffee and a bacon roll eaten. Talking to other sidecarrists who had arrived on Friday I was told that the entertainment that night was good; there was also music laid on for Saturday night. It was nice to see that Rebo was here and his outfit was on display. Mark Fowler’s new iridescent outfit sparked a lot of interest over the weekend at our end of the plot. The paintwork changed colour as you looked at it from different angles. 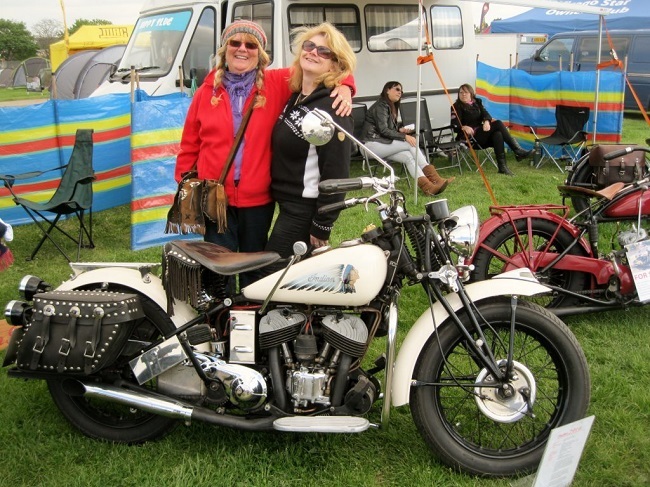 One thing that the ladies picked up on was a microphone in the sidecar; they felt that they would be able to tell the rider to speed up, slow down or pull over at the next café for a tea break. When you arrived at the showground you were given a show guide; this listed which events were on and where on both days. Basically there was something to watch from 10.00 am to 5.00 pm on both days. 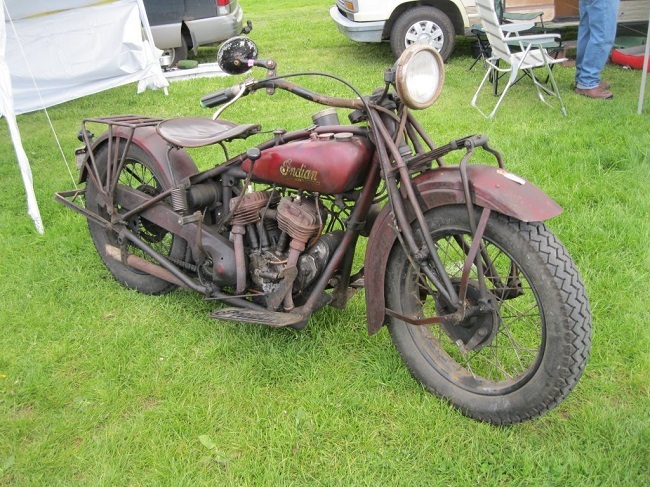 Most of the major manufacturers were here and they had brought along bikes that you could take for a ride out. The routes taken were a mix of fast A-roads and twisty country lanes. 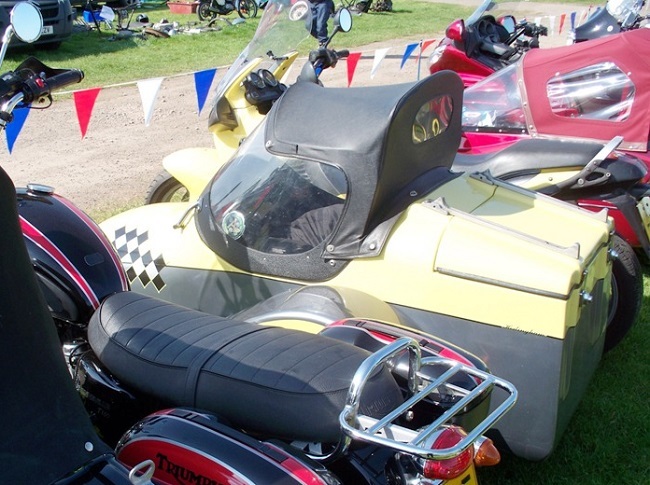 These ride-outs proved to be very popular, and were going out at regular intervals. 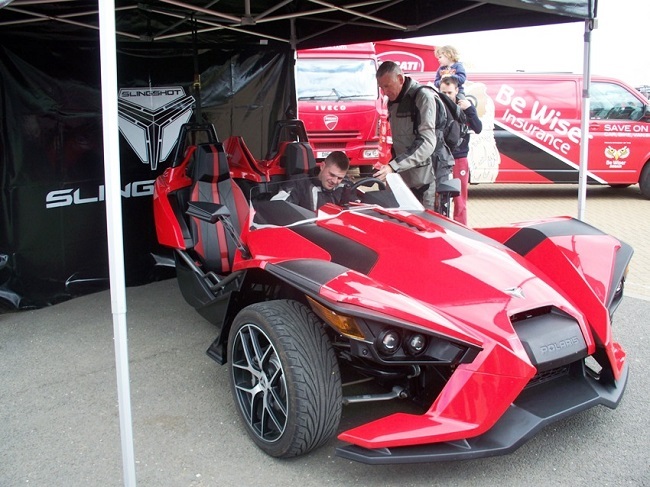 One of the stands opposite the ride-out departure bays was that of Indian Motorcycles; among their display was the Polaris Slingshot, a three-wheeler; this was a serious bit of kit – two wheels at the front, powered by a 2.4 litre engine. 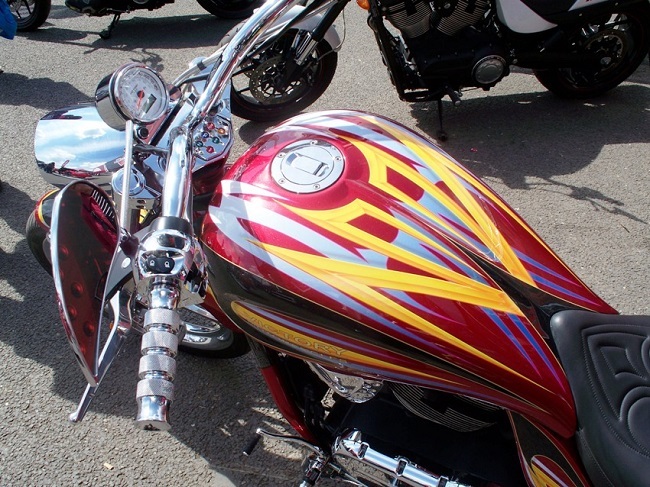 It looked very good, and I would have liked a test ride in this one. There was plenty to see, with lots of club stands to suite all tastes and lots of fast food outlets; one pasty stall did rather well. There was a stand from the Brown Bread Company; this seemed to do a steady trade – as well as bread it also sold cakes, samosas, pies and pasties. I really enjoyed a slice of their fruit cake. One of the highlights of the show were the Transatlantic Trophy Races between Colin Edwards’ American team and Chris Walker’s UK team; this was good dirt / flat track racing on the oval course in the centre of the showground, with plenty of seats to watch from. This was excellent – plenty of excitement to get the adrenalin going! Close to the oval track was a parade loop, where classic machines were run. It was nice to hear the different types of engines having a real go. 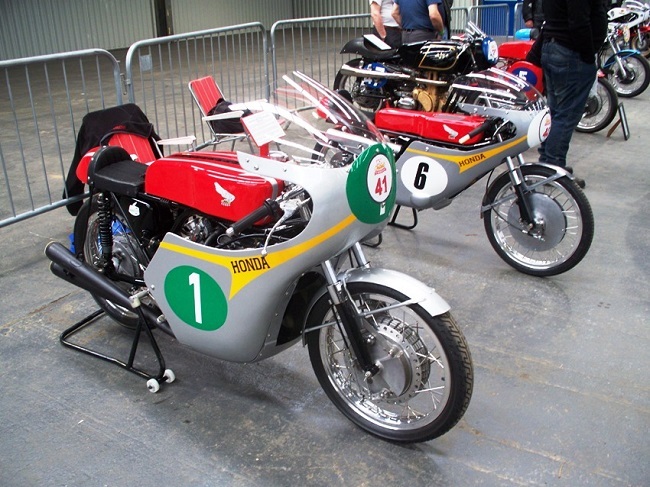 An AJS 7R looked and sounded good amongst all the multi-cylinder bikes. Chris Walker has recently turned his hand to sidecar racing, and he did a few parade laps on his outfit. 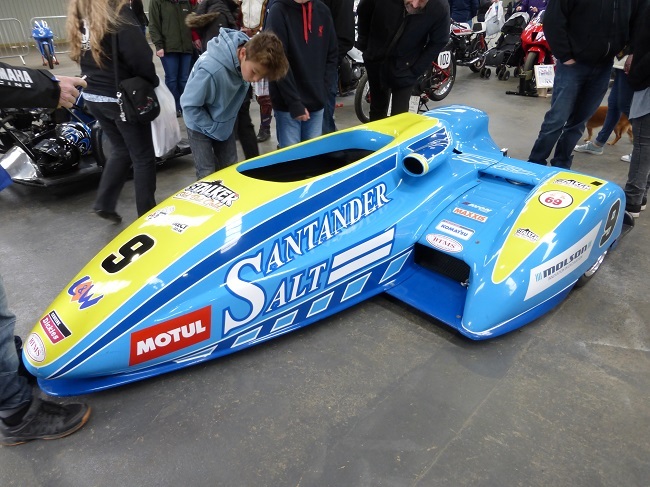 We were told over the tannoy that at his first sidecar race at Snetterton race track Chris finished in sixth place. Sunday morning the sun was shining early; Saturday had been dry but a little windy and cloudy with some sunny spells. Sunday turned out to be perfect day, and the ice cream stalls did a good trade. 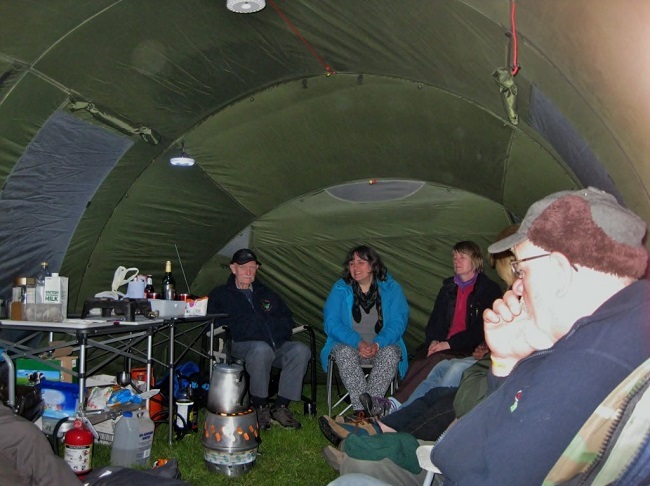 Ted and Linda arrived early on Sunday morning, having had a great time at the Martello Rally in Kent on the Saturday. Opposite “Sidecar Island” was an auto-jumbo plot. 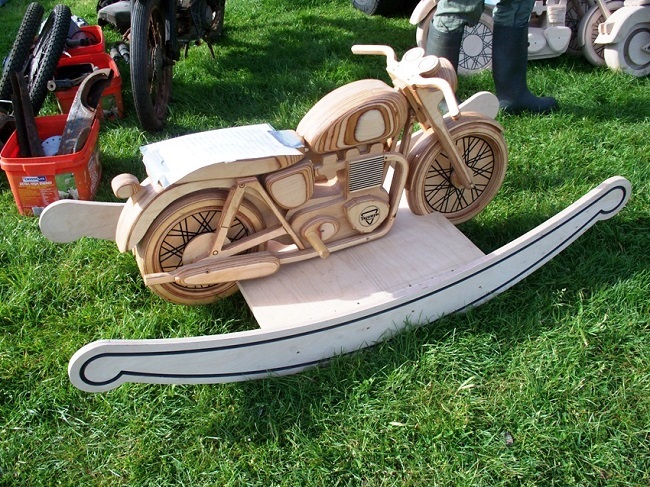 Among the stands here were “Steve’s Rockers”; these were rocking motorbikes made out of good quality plywood. These were really impressive. The one on display was like a Triumph, but he also does V-twins. 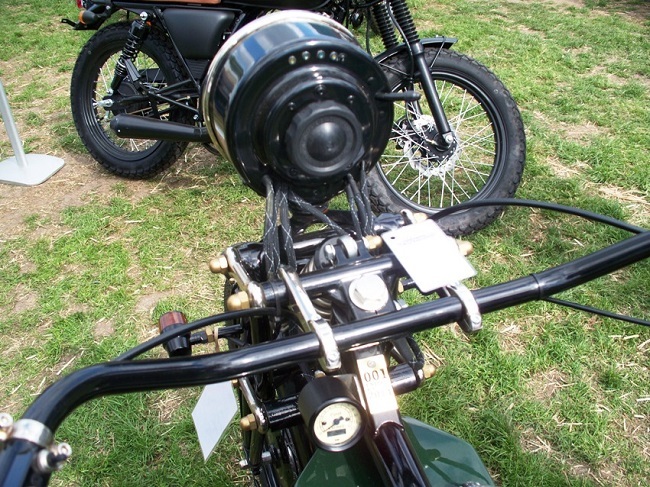 The price was from £400 for a half size Bonneville rocker (details from: stevejbaughn@gmail.com ). Makes a change from the bog-standard rocking horses!! 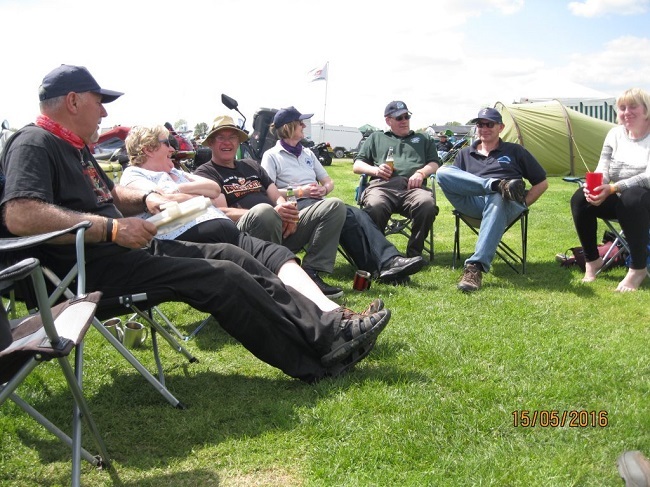 Later I got talking to Brian Rust, an ex sidecar racer. 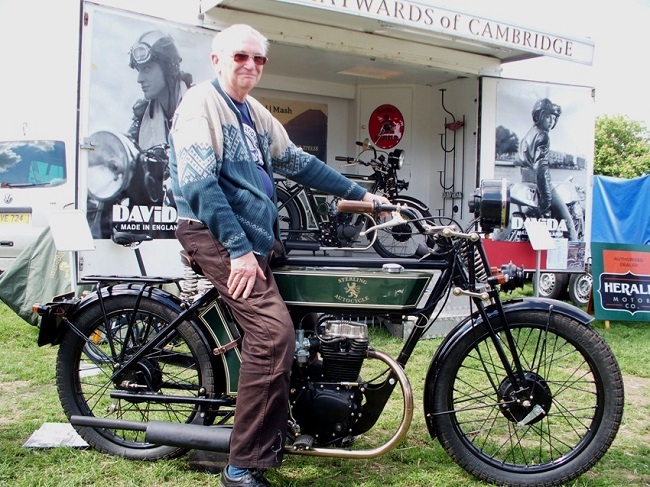 His son, Colin, used to race a Norton Rotary outfit, but this is now used for parade laps only. Colin had told me on a previous occasion that some spares can be expensive and tricky to obtain. On Saturday I had spotted the Hayward of Cambridge stand. 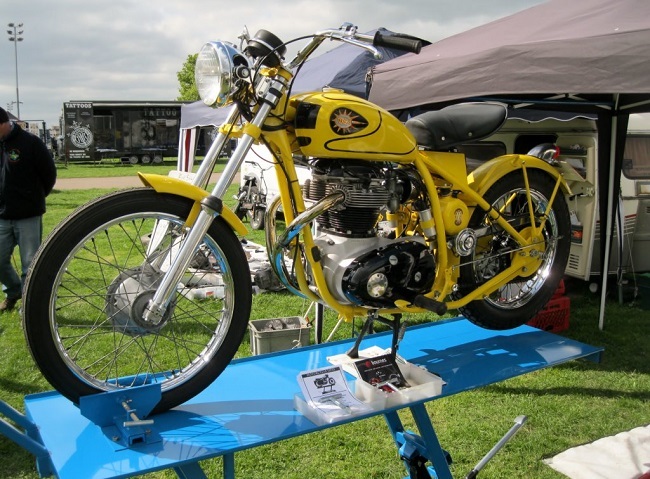 They had a couple of old motorcycles on display, but I did not take too much notice of them, looking instead at the various Royal Enfield models on display. Later one of the guys on our stand explained that these were new machines done in a 1920’s style, complete with a flat petrol tank. On Sunday I had trouble re-locating this stand, until Steve found it and pointed me in the right direction. 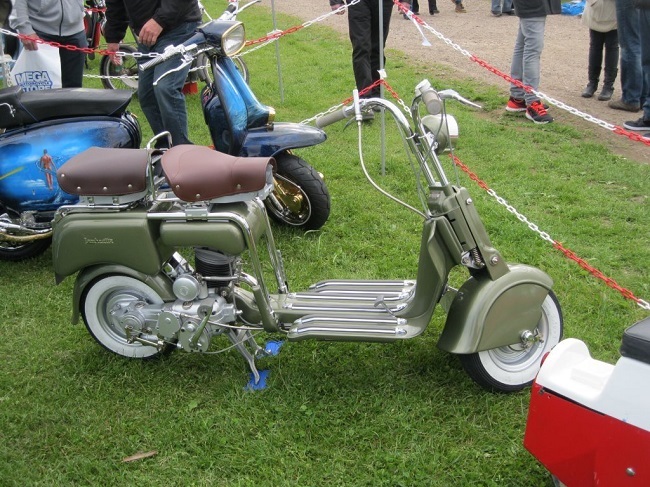 The machine called the “Sterling Drayton” was the work of a chap in Italy and had taken several years to perfect. The bike comes in either 125 cc or 230 cc capacities. David Stanley, Hayward’s Sales Manager, told me they have sold several so far, and that some of the owners are going to ride them back to Italy. This is a cracking bit of kit that you could have serious fun with! 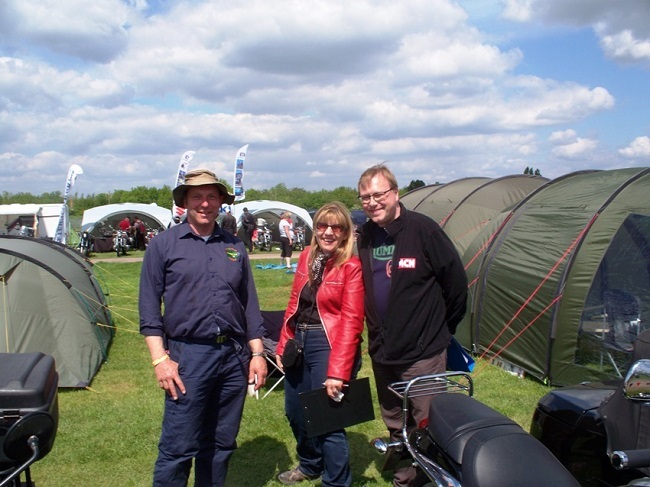 On Sunday afternoon Martyn and I were lucky to meet up with Dan Sagar and Kimberly, both of who work for MCN. I got a photo of them and Martyn standing alongside an outfit fitted with a Watsonian sidecar. Dan was delighted with the display of outfits and hopefully we can work together again next year. 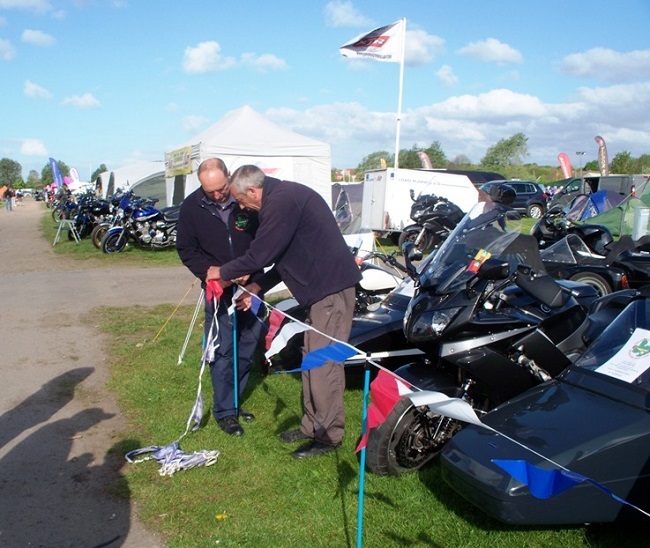 There were lots of stalls selling riding kit at good prices plus plenty selling tools etc. 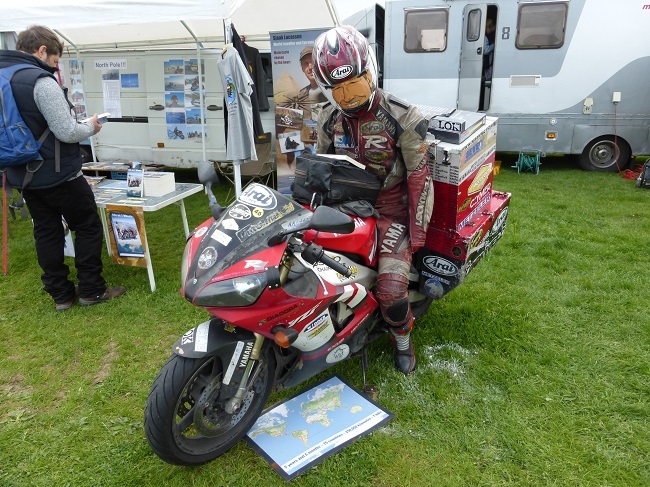 Traders ranged from motorcycle specialists (powder-coating, custom workshops, ear plugs, action cameras, etc) to books. You could even book trips abroad! There was so much to choose from. This was a really good weekend. 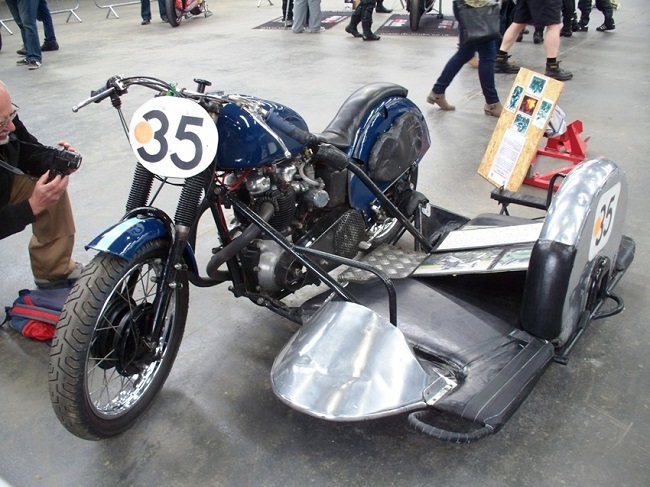 Well done to MCN and thanks to all outfits and their riders that made “Sidecar Island” such a success. it was too much for some.